WWII POW Camps in the U.P. 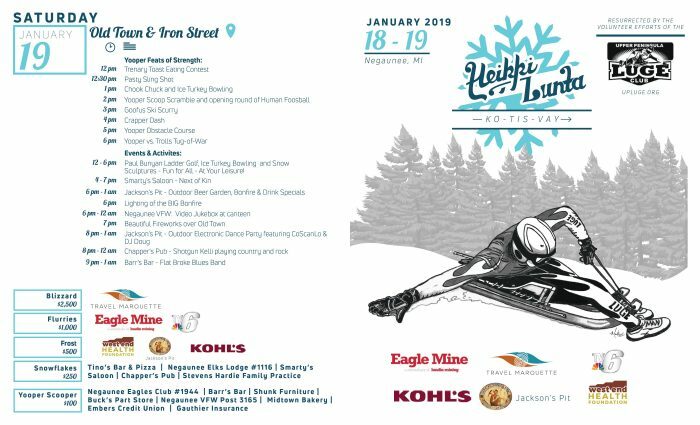 Tis-Vay to the 2019 Heikki Lunta Festival to be held on January 18th & 19th in downtown Negaunee. Friday evening we will begin the festival with a winter parade down Iron Street, an opening ceremony at Breitung Park, the inaugural Freeze Yer Fanny Fat Tire Bike Race and live music at local establishments. Saturday will be filled with a full schedule of events to include something for everyone: Pannu Kakku breakfast, Tori Art & Craft Sale, cultural displays, guest speakers, an old school snowmobile show, White Water dance, ski jumping at Suicide Hill and luging open to public at Lucy Hill. A full line-up of Yooper Feats of Strength are also slated: Yooper Scoop Scramble, Trenary Toast Eating Contest, Ice Turkey Bowling, Yooper Obstacle, Crapper Dash, Chook Chuck, Human Foosball., Pasty Sling and the Goofus Ski Scurry. The festival will wrap up Saturday evening with a bonfire, fireworks over Old Town and live music all up and down Iron Street! Want to know more about Heikki Lunta's origins?